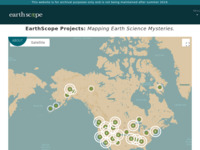 EarthScope applies modern observational, analytical, and telecommunications technologies to investigate the structure and evolution of the North American continent and the physical processes controlling earthquakes and volcanic eruptions. Imaging the crust and mantle at an unprecedented scale, EarthScope integrates new observations from cutting-edge land and space based technologies to measure deformation in real-time at continental scales. These observations, integrated with geologic data, yield a comprehensive time-integrated picture of continental evolution and link surface features with their structures at depth. The site houses a number of original data sources (such as real-time seismic data and maps), a gateway to current seismic news and events, and Earth sciences related community event calendars.